"A page turner ... an exceptional example of the true-crime genre." "Fascinating ... a remarkable book." Update: Searching for Mrs. Luetgert's ghost: newly discovered information. 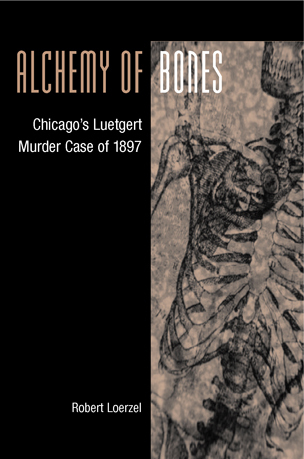 Upate: What happened to the bones from the Luetgert trial, which is chronicled in Alchemy of Bones? The fate of this crucial evidence is a mystery, but now a possible answer has emerged. Radio interviews with Robert Loerzel are available for listening on the Web from WBEZ, WUIS, WILL and KWGS. 320 Pages, 7 Photographs and 38 Line Drawings. Paperback: $19.95 / Hardcover: $29.95. This Web site is a companion to Alchemy of Bones, featuring a wealth of information about the people, places and subjects in the book — including many stories, facts and pictures beyond those in its pages. The author hopes that this Web site will aid people researching the history of Chicago in the 1890s, genealogy, and topics such as criminology and journalism. This Web page is designed and run by Robert Loerzel. All contents are © 2003 by Robert Loerzel except for those articles and illustrations that are taken from public-domain sources and fair-use quotations from copyrighted sources. Book cover design by Paula Newcomb/University of Illinois Press.